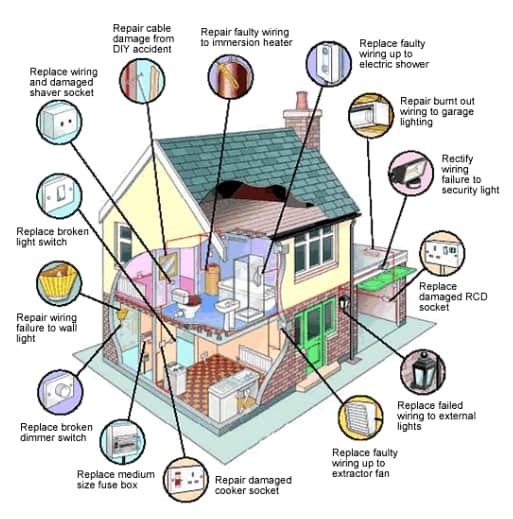 The following information is to help homeowners deal with some of the common electrical problems found or encountered in residential dwellings. Gibson must disclose and put the reader and/or end user of this guideline on notice that these are trade techniques used by many electrician’s in order to troubleshoot and find the electrical problem area and/or issue. Gibson is not to be held responsible for any damages or inquires that may result if used and/or not used properly. No person should ever work on a powered circuit without the proper (PPE) Personal Protective Equipment. Injury and/or death can and has occurred. If you feel concerned and/or unsafe about electrical shock (as you should be), please contact Gibson Electrical & General Contractors, Inc and our professional staff will troubleshoot for you. Single Light Not Working: This is normally a light bulb (lamp) problem. First, shut the power off feeding the fixture. Be sure to wear gloves and/or safety glasses if overhead. Try to replace the bulb. If the light still doesn’t work, try again with another bulb that you know works. Sometimes lamps have slight ridges in the socket that will make it feel tight before it’s all the way in the socket. Multiple Lights Not Working In Various Locations: This is almost always an electrical problem however; it may be a problem with the Utility Company’s underground or overhead lines. During the course of construction and/or installation, underground or overhead wires are sometimes inadvertently damaged. Over the years, these wires and insulation break down and eventually fail. If your 240 volt appliances such as A/C units, wall ovens or well pumps are working as usual, it is probably time to call Gibson Electric to troubleshoot. If not, you should call the Utility Company and ask them to check the power lines. The distance of the house from the power company’s transformer. Now THEN, let’s not discount the real possibility of a loose connection. THIS IS BAD!!! Loose connections create arcing and sparking. This generation of heat can in turn produce a fire. This should be considered the number one cause of fires in residential dwellings. If you hear crackling, sparking, lights are flickering for no reason or if you smell an odd odor like hair or plastic burning, this could be a loose connection and the onset of a fire. You should shut that individual circuit breaker off and call the Fire department and Gibson Electrical Contractors, Inc. to investigate the issue. If you cannot identify the individual circuit breaker, shut the main breaker off until the Fire Department gives you the all clear. lower the dimmer back to a slightly increased light level. If the inoperative receptacles are in the kitchen, garage, bathroom, basement, laundry room or outside maybe the best place to start would be to check the local Ground Fault Circuit Interrupter (GFCI) receptacle. (See below) It will be located in one of the aforementioned locations in the circuit wired from or after that outlet. Press the “R” (reset) button on the GFCI receptacle and recheck for power. Be sure you have depressed the reset button completely. You should hear a slight “click” sound. If the outlet will not reset, DO NOT keep trying to reset it as you could destroy the GFCI and/or other equipment further down the circuit. If the inoperative outlets are not in the above mentioned areas, Gibson could come out and check the circuit breakers to see if one has tripped. Multiple Receptacles Not Working: In newer homes the code requires Arc Fault Breakers to be installed in the panel to protect the dwelling occupants and property from risk of shock and/or fire. The problem could be fixed by resetting the Arc Fault Breaker. Before you reset any breaker you should ask yourself “Why did the breaker trip in the first place?” There could be a dead short. GFCI Receptacles: If a GFCI will not reset: Severe rainstorms or extended periods of rain could cause moisture to build up in outdoor receptacles. This is the most frequent cause of GFCI tripping. Allow some time for these outlets to dry out after conditions improve. Do not continually try to reset the GFCI or you could damage it. This rain caused tripping should continuously occur. If this happens every time it rains your weatherproof outlet or box may need to be replaced or resealed. Inspect these types of boxes often for obvious gaps and reseal with silicone. A GFCI will not reset if the problem still exist. The problem could be whatever is plugged into one of the GFCI protected outlets. Defective or damp appliances such as night lights, hair dryers, weed whackers etc. could be the blame. Holiday lights with defects in the cords or extension cords that become wet from rain or dew can also become a problem. Refrigerators, freezers, dehumidifiers, garage door opener that are plugged into basement or garage GFCI protected outlets are often the cause of the problem. These loads are not meant to be plugged into a GFCI protected circuit and will eventually cause the GFCI to trip. These appliances should be relocated to a Non-GFCI protected location or a Non-GFCI protected outlet should be installed by a qualified electrician. Not Working: The test button should be held for at least 15 seconds to allow time for the test simulation to activate. If the unit still does not sound, it is most likely defective. Sounds For No Reason: Dust, moisture and insects can team up to cause false alarms and/or soundings. Try cleaning the smoke detectors with a powerful vacuum or blow them out using a can of compressed air. (Available at local office supply stores) Electrical surges caused by lightning storms can also trigger the smoke detectors. Broiling or heating ovens that have cooking residue in them will quickly cause a smoke detector to activate a false alarm. If a smoke detector sounds more than just occasionally, one of them could be defective. When any interconnected smoke detector is triggered, it will in turn sound all the other smoke detractors in the house as well. In order to replace the defective unit, we need to identify it first. To do this, look at each of the detectors while they are still in alarm and sounding. The smoke detector that blinks red once per second is the unit that is triggering all the others. If it is the same smoke detector several times, that’s the culprit. Beeps Occasionally: This normally means it’s time to replace the back up 9 volt battery located inside the standard smoke detectors. This is true only if your smoke detector has a battery backup. When changing the battery’s, shut the power off and make sure the positive and negative (polarity) of the battery is positioned correctly. Then, restore the power to the circuit. We hope these simple/basic descriptions have been helpful to you. As always, a live person at Gibson Electrical is standing by to help you with any and all of your electrical needs. If you have found this to be helpful, please leave us a nice review as you have just saved a service call fee.